The Most Delightful Game Development Engine Ever. Introduced in 2005 as a Mac game development tool, Unity has grown into a multi-platform monster, used to make games for everything from Facebook to consoles — but none of that really mattered, until it got an official anime mascot. Meet Unity-Chan. 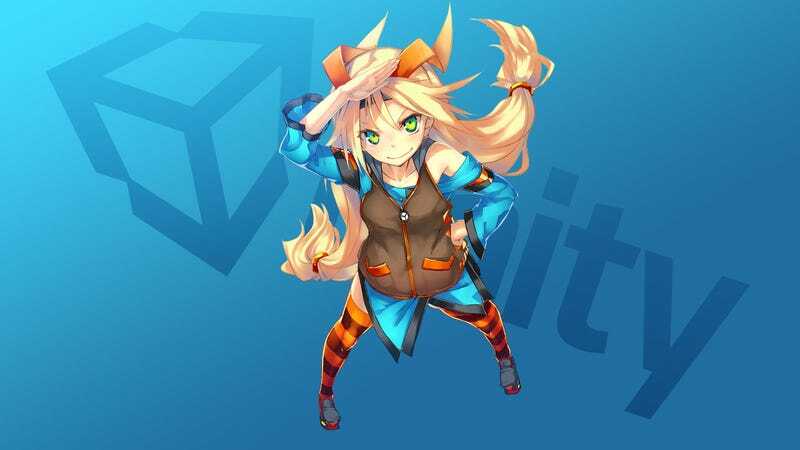 Just like the general public didn't care about Internet Explorer until it got an official anime mascot character, I fully expect Unity-Chan to be the start of cultural recognition of one of the most utilized game development tools in existence. And should she fall short of my expectations, that's only because they were completely unrealistic. Unity-Chan has her own official website (thanks, Michael! ), where she'll soon have her own official blog, as well as 3D assets to download, so developers can use her in games. She'll even have her own booth at the Comic Market 85 show in Japan, with limited edition posters and an art samples for the kids. Looks like Unity-Chan is the product of a collaboration with Japanese RPG developer Gust, so I fully expect cameos in future Atelier games. And then all of Japan started developing games on Unity.